The last post showed Godzilla Motorsports black R35 Nissan GT-R drag car with RB power. This post from the Jamboree site shows this, what looks like it might be a TB series inline 6 engine in the drag car. Glad to see its not a 2JZ. The car looks like it is coming together nicely. Looks like it needs inlet piping, intercooler piping, and wiring to make it complete. Looks like a large turbo- maybe something around a GT55. Other than the Nissan Patrols in Dubai, I have not seen this engine(TB?) used in any other cars. I will be looking for some details, and clarification on the specifications of this engine. The interior is all business. Pro stock style shifter probably shifting a Lenco transmission. Lots of carbon fiber, fire bottle, driver set way back. The car looks like it is running on 10.5W tires. How fast will it go? How much power does it make? What engine is actually in it? Will they try a VR38 eventually? All those questions remain to be seen. The Jamboree kicks off on August 27th in Brisbane, Australia. 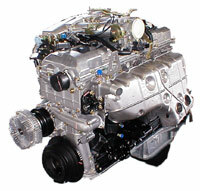 Doing a little more research, it sure does look like a TB48 dual overhead cam engine. The valve cover, and the CAS sensor looks correct. Intake and exhaust are on the correct sides. 8-23-11 A few more pictures over at the Dragnews Australia site. The car looks nearly ready to run.